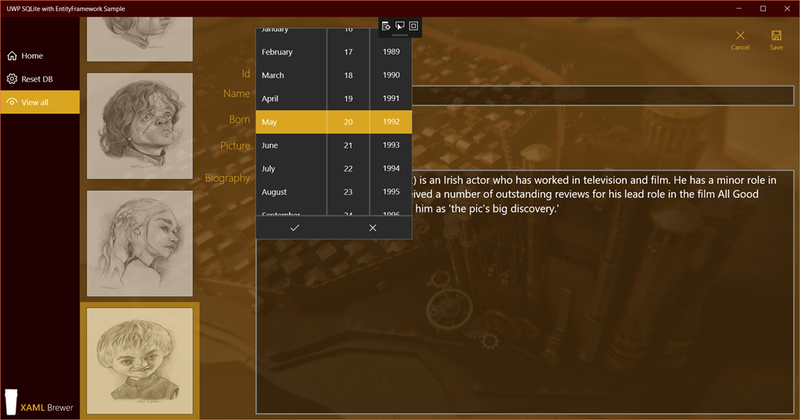 In this article we’ll show how to use Entity Framework Core and SQLite in a UWP app. We’ll use the code-first approach to define and generate a local SQLite database with one table, and and then perform all CRUD operations against that table. For the data definition as well as the data manipulation, we’ll be using only the Entity Framework API – no native SQL involved. does all of that in a MVVM architecture. A long time ago, in a .NET galaxy not far away, the Entity Framework (EF) became the de-facto standard object-relational mapper. EF enables developers to work with relational data by using domain-specific objects. Its most recent version –EF Core- is not an evolution from its previous versions, but a complete rewrite from scratch. The new EF Core not only runs on the full fledged .NET stack – where so you can use it in Windows Forms, ASP.NET, WPF, and/or WCF. EF Core also runs on the ‘lighter’ .NET versions: .NET Core, ASP.NET Core, and the Universal Windows Platform (UWP). The list of databases that you can connect to with EF Core includes all SQL Server editions, SQLite, PostgreSQL, MySQL, IBM Data Servers (DB2 and IDC) and even in-memory data (for testing). All of these totally different platforms can be accessed using the same C# code. For more info on Entity Framework, start reading here. The EF Core specific documentation is here, its source code lives here. SQLite is a free public-domain transactional SQL database engine. The SQLite engine runs embedded in your apps – there is no separate server or background process. A SQLite database can host multiple tables, indexes, triggers, and views, and is contained in one single disk file with a cross-platform format. On the Unified windows Platform, SQLite is the de-facto standard for local single-user databases. If you want to know more about SQLite, start reading here. 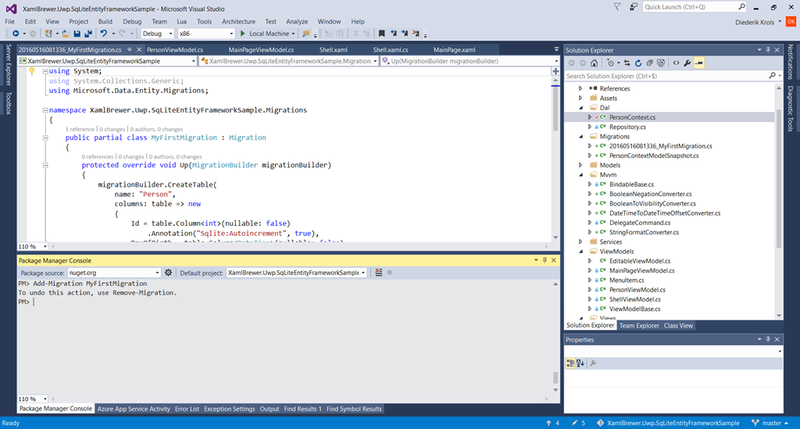 Enough introduction, let’s dive into Visual Studio. In the code-first EF approach, you start by building the model. The framework will create the code that generates the database schema at runtime. The model consists of a set of regular C# class definitions. It is possible to use attributes on top of class and property definitions to specify the name of the tables and columns that will be generated, and to specify primary keys, maximum lengths, foreign key relations, and even inheritance relations. All of these are documented here. On top of that, EF uses some conventions. An example: if you use Id as a property name, the corresponding column will be defined as primary key. When you defined the model, you need to specify which of these classes will end up in the database schema. All entities of which you create a DbSet inside a DbContext will be picked up by EF and added to the schema. OnModelCreating allows you to refine the physical data model through a fluent API (which I personally prefer over using data annotations in the model classes). The documentation on this is spread over all articles here (look in each article for the paragraph with the title ‘Fluent API’). /// The Entity Framework Database Context. At this stage, the physical database is still not created yet. We still need to generate the code for that. The database file is not part of the package that you deploy, but it is created by running the app. EF provides two approaches for this: a call to EnsureCreated (sorry: I found no URL to a description of this method) or using Migrations. It’s fairly safe to assume that in most apps the data model will evolve during the lifecycle. The preferred technique in this scenario is to rely on the Code First Migrations feature. Here’s how to enable and use this feature. If you want to know more about it, here’s a tutorial on EF Core migration commands. You want to make sure that your end users generate their first version of their local database when they run the app for the first time. You also want to make sure that they migrate to the new data model after they installed an upgrade of your app. I’m pretty sure that you don’t want your end users to run install and upgrade scripts, so your app needs to automagically take care of the migration. 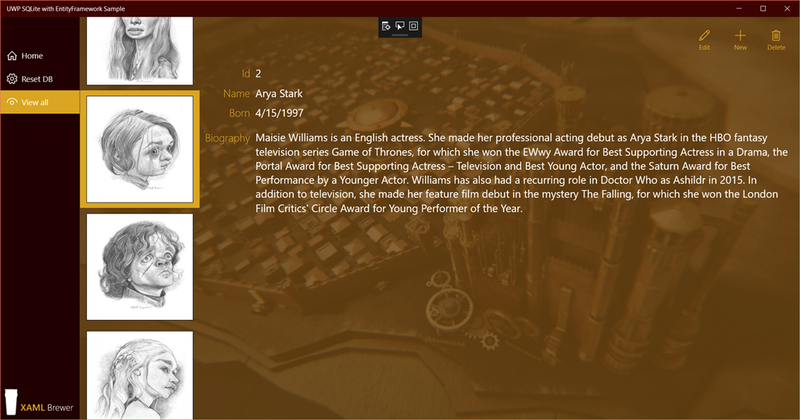 The database and the tables now exist, let’s now play with the content. There’s more info on EF Core entity change tracking and persistence right here. The sample app lives here on GitHub. It contains some useful code that was not discussed in this article, like how to transform the profile picture to and from a byte array, and how to two-way bind the birthday to a DatePicker control. The awesome Game of Thrones caricatures are made by Paul Moyse. 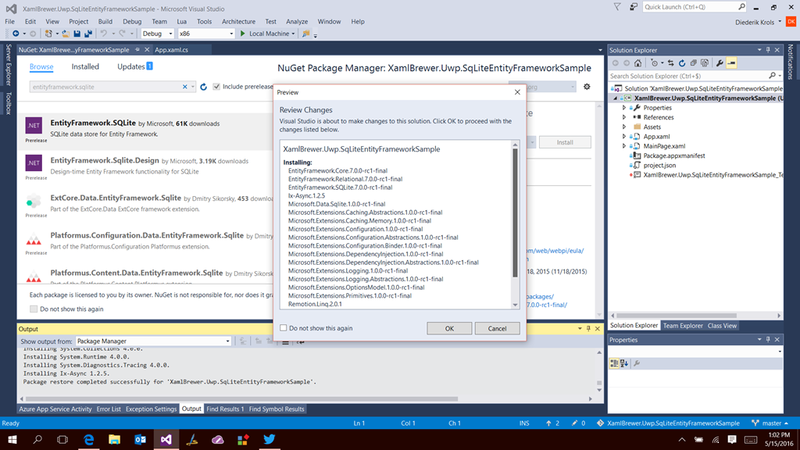 This entry was posted in Entity Framework, SQLite, UWP on June 1, 2016 by xamlbrewer.